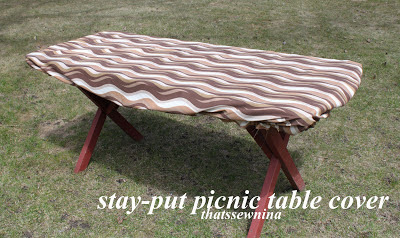 One of my college friends posted this great idea of making a DIY custom tablecoth using a standard tablecloth and sewing some elastic around the fabric to gather the ends under the table. I loved this idea and was just waiting for the right project to pop up to use it. When I recovered our outdoor patio chairs (post to come soon! ), I miscalculated how much fabric I would need and ended up with four extra yards (... um, yeah. WAY over-calculated but it was 50% off so I wasn't being too careful.) 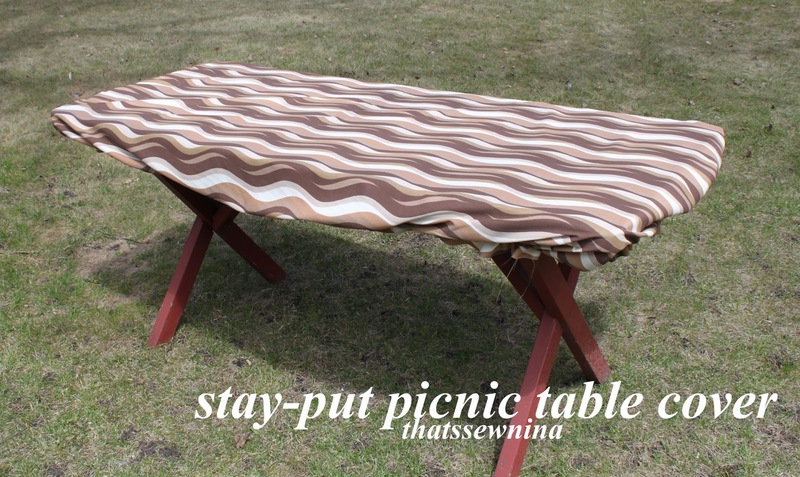 This project came to mind and I realized what a perfect fit it would be for a picnic table cover. Yup, that's pretty much it. No worry about being too exact. If you're doing a circular table, you may want to lay your fabric on top of your table like my friend Patricia and trace out the edge of the table with a fabric marker. Add five inches on each side of your above measurements and cut out your fabric. If you are using a fabric that frays a lot, you may want to take the time to zig-zag stitch around the edges to limit fraying. Remember that this is going to be under the table so you won't see much of it so it doesn't have to be pretty. To sew the elastic on, pick a starting point and line up your elastic on your fabric and put your needle down into the elastic and fabric. Back-stitch a few stitches to secure and sew on! As you sew, stretch your elastic tight. I made a rectangular tablecloth so I back-stitched and cut my elastic at the end of each side. For a round table you can just keep on going. Step 4: Enjoy your stay-put table cover! When you're done sewing, pull it off your machine and try it out! What a great idea! No need for annoying clips or picnic table weights. Coming soon... DIY cushion covers!